Happy holidays! Here comes part 3 of my Christmas countdown. December is super busy for me this year, and there is no time to decorate or make cookies. So I’ve been trying to get into the holiday spirit by remembering some of my favorite holiday films and TV shows. Here are a few funny TV holiday moments. From Friends: They actually had quite a few fun Christmas episodes. I particularly like the one from season 2 where Phoebe attempts to find her real father, and Monica and Rachel’s Christmas party turns into a sauna when the radiator breaks. However, nothing tops the Holiday Armadillo. He’s your part Jewish friend! Ross often gets overlooked, but that dude got into some wacky situations. Getting stuck in a pair of leather pants, over-whitening his teeth, a spray-tan mishap, attempting to play the bagpipes…all that and he dresses up in a ridiculous costume for his son. Props to David Schwimmer. He’s a very funny guy. From Frasier: They also did several Christmas episodes, and all of them are pretty great. I’ve got a couple written down, but instead of the obvious one (and if you are a regular reader of this blog you probably know which episode I’m talking about) we’ll go with the final season’s High Holidays. All you need to know is that Niles thinks he is high, and Martin actually IS high. On behalf of all the goyim, and until next time, happy holidays! 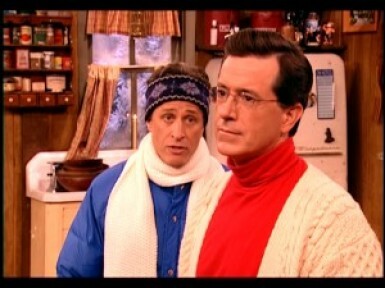 This entry was posted in Big Bang Theory, Classic TV Clips, Stewart/Colbert, tv by Sarah. Bookmark the permalink.